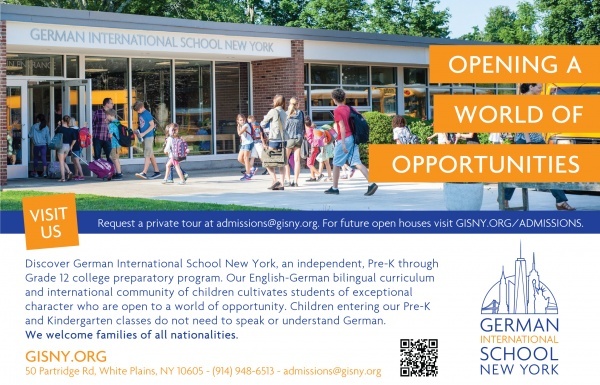 Discover German International School New York, an independent, Pre-K through Grade 12 college preparatory program. We are the only school in the tri-state area where graduates earn a High School Diploma and the German International Abitur. Learn how our English-German bilingual curriculum and international community of children create students of exceptional character who are open to a world of opportunities. Prior knowledge of German is not necessary for Pre-K and Kindergarten. We welcome families of all nationalities. Visit us to learn more about GISNY, an independent, pre-K through 12th grade, bilingual, college preparatory program. Open houses on Sept. 28, Oct. 19, Nov. 16, and Jan. 25.